Pulling down a wall reveals a door. This reveals a Boo and Hider scheming. 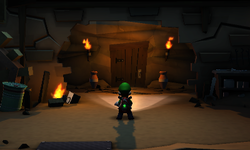 The Roundhouse Pit is a room inside the Old Clockworks in Luigi's Mansion: Dark Moon. The Roundhouse Pit is accessed by taking the north door inside the Canyon Hall. It's a large room that is partly blocked off by large bricks. There are a few boxes and barrels scattered in the room as well as large gears. Some shelves with containers are found here as well as a sarcophagus. Behind the brick wall, there are two vases and a door that leads to the Pit Slide. During Underground Expedition, Luigi needs to travel through the Roundhouse Pit in order to reach the Tomb where the minute hand is. If Luigi hides in the sarcophagus, he watches a Boo and a Hider place a bomb inside a barrel. The Hider then hides in a nearby barrel. After Luigi enters the Pit Slide room and feels the earth shake, he can go back into the Roundhouse Pit to find many Gold Bars scattered on the floor as well as gold spiders hanging from the ceiling and climbing on the walls. The way back to the Canyon Hall is now blocked, though. This page was last edited on September 16, 2017, at 02:46.